Retinal venous occlusive events are a rare complication of arteriovenous malformations of the retina found in Wyburn-Mason syndrome. The authors present a case of a 28-year-old man diagnosed with Wyburn-Mason syndrome and cutaneous reactive angiomatosis, a reactive angioproliferative disorder induced by vascular occlusion. 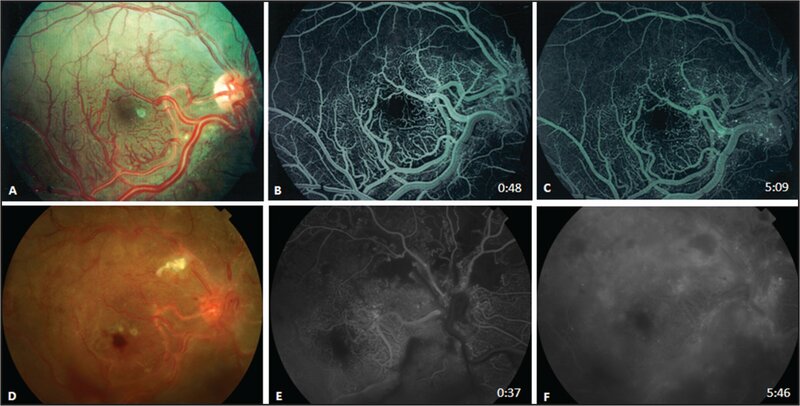 He developed a central retinal vein occlusion complicated by macular edema and received treatment with intravitreal bevacizumab, which led to resolution of the edema. To the best of the authors’ knowledge, this is the first report of an anti– vascular endothelial growth factor agent employed as an effective treatment for macular edema in the setting of Wyburn-Mason syndrome. The association between Wyburn-Mason syndrome and cutaneous reactive angiomatosis is also a novel finding. From the Retina Service, Massachusetts Eye and Ear Infirmary, Harvard Medical School, Boston, Massachusetts. Dr. Yonekawa is partially funded by the Heed Ophthalmic Foundation. The foundation had no role in the design or conduct of the study. Dr. Eliott is an ad hoc consultant for Genentech. The remaining authors report no relevant financial disclosures. Address correspondence to Dean Eliott, MD, Massachusetts Eye and Ear Infirmary, Retina Service, 243 Charles Street, Boston, MA 02114; 617-573-3736; fax: 617-573-3698; email: dean_eliott@meei.harvard.edu. Wyburn-Mason syndrome (also known as Bonnet-Dechaume-Blanc syndrome) is a rare sporadic phakomatosis characterized by arteriovenous malformations (AVMs) of the retina, often in conjunction with ipsilateral AVMs of the brain and facial skin. Ocular complications include retinal and vitreous hemorrhage, proptosis due to AVMs in the orbit, and visual disturbance due to intracerebral AVMs or hemorrhage.1 More rarely, retinal venous occlusive events have been reported.1–3 We present the use of intravitreal bevacizumab in a rare case of central retinal vein occlusion (CRVO) in the setting of Wyburn-Mason syndrome. A 28-year-old man presented to the Massachusetts Eye and Ear Infirmary emergency department for vision loss in his right eye for 1 day. He had been diagnosed with Wyburn-Mason syndrome 1 year prior, with baseline vision of 20/20 in both eyes (Figures 1A–C). (A) Baseline color fundus photograph demonstrating grossly dilated vessels with abnormal capillary network consistent with arteriovenous malformation of the retina. (B) Baseline fluorescein angiography (early phase) demonstrating full perfusion of the posterior pole. (C) Fluorescein angiography (late phase) demonstrating the absence of leakage. (D) Fundus photograph demonstrating similar arteriovenous malformations now with vitreous and intraretinal hemorrhages, capillary drop-out, and cotton wool spots. (E) Fluorescein angiography (early phase) demonstrating capillary drop-out and macular leakage. (F) Fluorescein angiography (late phase) demonstrating diffuse late leakage. On initial examination, his visual acuity was light perception in the right eye and 20/25 in the left eye. A relative afferent papillary defect in the right eye was noted. Anterior segment examination and intraocular pressures of both eyes were normal. Dilated fundus examination of the right eye revealed vitreous hemorrhage and diffusely dilated and tortuous retinal vessels. Fundus examination of the left eye was normal. Five days later, the vitreous hemorrhage cleared, revealing a thickened macula, sheathed and dilated tortuous vessels consistent with AVMs, scattered intraretinal hemorrhages, and areas of retinal neovascularization (Figure 1D). Spectral-domain optical coherence tomography (SD-OCT) demonstrated large intraretinal cysts in the right macula (Figure 2A), and fluorescein angiography showed delayed venous filling, extensive areas of capillary non-perfusion, diffuse macular leakage, and areas of late leakage consistent with retinal neovascularization (Figures 1E–F). Imaging of the left eye yielded normal findings. He was diagnosed with CRVO and macular edema in the setting of Wyburn-Mason syndrome and was treated with intravitreal injection of 1.25 mg of bevacizumab. Two weeks later, vision improved to count fingers at 2 feet, and SD-OCT showed almost-complete resolution of the intraretinal cysts, but with significant disruption of the inner segment/outer segment junction, most likely related to the occlusive event and longstanding macular edema (Figure 2B). 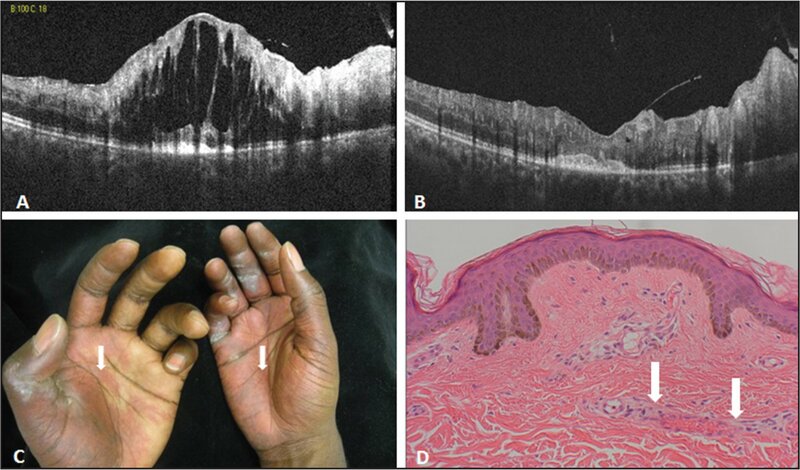 He subsequently received panretinal photocolagulation for extensive retinal ischemia and retinal neovascularization. (A) Spectral-domain optical coherence tomography (SD-OCT) showing cystoid macular changes. (B) SD-OCT 2 weeks after injection of bevacizumab showing near-complete resolution of the intraretinal fluid. (C) Violaceous rash of extremities. (D) Hematoxylin and eosin (200×) punch biopsy of involved skin showing rare congested vessels (arrow). His medical records revealed a history of a diffuse violaceous rash of the extremities, characterized by ectasia and rare congested vessels on punch biopsy (Figures 2C–D). Without knowledge of his retinal findings, the dermatology and dermatopathology team independently suggested these findings could be consistent with cutaneous reactive angiomatosis, a reactive angioproliferative disorder induced by vascular occlusion from an underlying systemic disorder;1 however, additional extensive systemic work-up findings were normal. AVMs create a high flow state with increased intravascular pressure, which may lead to endothelial damage, thickening of the vessel wall, and subsequent thrombosis of the vessels. This theory is supported by Green et al’s histopathologic studies of AVMs demonstrating fibrosis and thrombosis of the vessels.6 Alternatively, others have proposed compression of the dilated central retinal vein at the level of the lamina cribrosa as the underlying mechanism of CRVO in AVMs.1 Very few cases of CRVO with ischemic sequelae in the setting of retinal AVMs have been described.2–4 Zylberman et al described a case of capillary nonperfusion and neovascular tufts in the retina after CRVO in a patient with retinal AVM.2 Vitreous hemorrhage secondary to neovascularization was described by Salati et al in a case of CRVO in a patient with retinal AVM.7 Finally, there are three cases reported in the literature of neovascular glaucoma as a sequela of CRVO in patients with retinal AVM.3,4,8 As found in other mechanisms of CRVO, macular edema might also be expected as a complication of CRVO in retinal AVM, although this has not been previously described. Although known to be associated with systemic arteriovenous malformations, dermatologic findings suggestive of cutaneous reactive angiomatosis have never been described in conjunction with retinal AVMs. Their similar vascular propensity is intriguing, and one might contemplate whether these two entities could have an underlying association. However, given the rarity of both conditions, the correlation and significance of these findings remain unclear. In the reported cases of neovascular complications of CRVO in retinal AVMs, panretinal photocoagulation was applied as treatment.2–4,6 In recent years, clinical trials have established the efficacy of anti–vascular endothelial growth factor (VEGF) agents for the treatment of macular edema in CRVO.2 However, the use of anti-VEGF agents for CRVO with macular edema in the setting of retinal AVMs has not been previously described. We extrapolated the data from clinical trials for macular edema in the setting of CRVO to support the use of intravitreal anti-VEGF in our patient. Although the visual acuity improvement was guarded in our case, the anatomic recovery was impressive. To our knowledge, this is the first report of bevacizumab treatment for CRVO with macular edema in the setting of retinal AVMs in Wyburn-Mason syndrome. Zylbermann R, Rozenman Y, Silverstone BZ, Ronen S, Berson D. Central retinal vein occlusion in a case of arteriovenous communication of the retina. Ann Ophthalmol. 1984;16(9):825–828. Green WR, Chan CC, Hutchins GM, Terry JM. Central retinal vein occlusion: A prospective histopathologic study of 29 eyes in 28 cases. Retina. 1981;1(1):27–55. Effron L, Zakov ZN, Tomsak RL. Neovascular glaucoma as a complication of the Wyburn-Mason syndrome. J Clin Neuroopthalmol. 1985;5(2):95–98.